The Domo Appstore is home to roughly 1,000 different applications that our customers can use to solve specific business challenges. While it would take us way too long to tell you about every one of them, our App of the Week series is giving readers a taste of just a few of the ways they can customize our platform to tackle the unique problems facing their companies. This week, we’re turning the spotlight toward Google Maps Pinboard, a powerful tool for getting the most out of your geographic and location-based data. 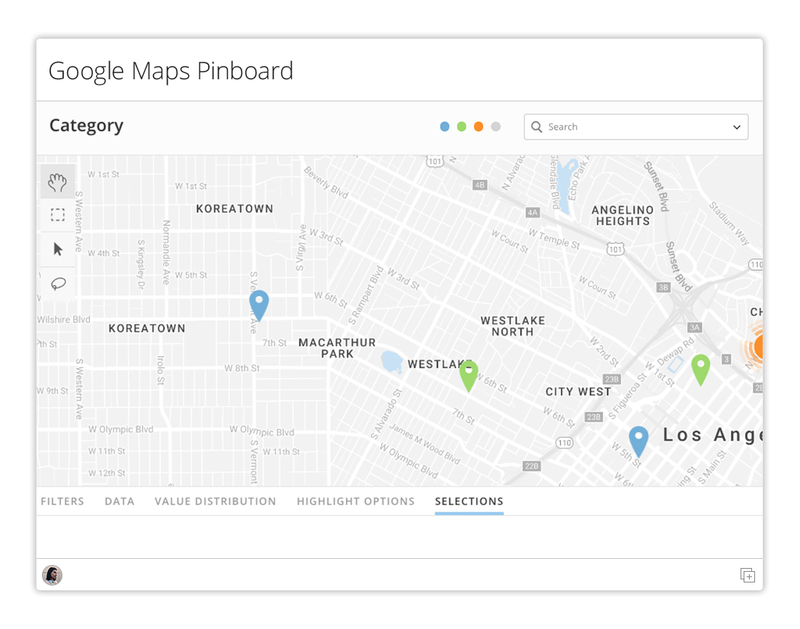 Google Maps Pinboard allows you visualize location data with unprecedented ease. Location data can be an extremely valuable tool for understanding business performance, but making sense of that information isn’t always easy. After all, there’s not much you can learn from a spreadsheet of zip codes or GPS coordinates unless you have a ton of time on your hands or an encyclopedic knowledge of world geography. Google Maps Pinboard allows you to unlock your geographic information without forcing you to compile and plot the data points yourself. Instead, you can simply funnel your information into the app and watch as it instantaneously pins each data point to a world map. As a result, you can clearly see location-based patterns and trends that otherwise would not have made themselves apparent. 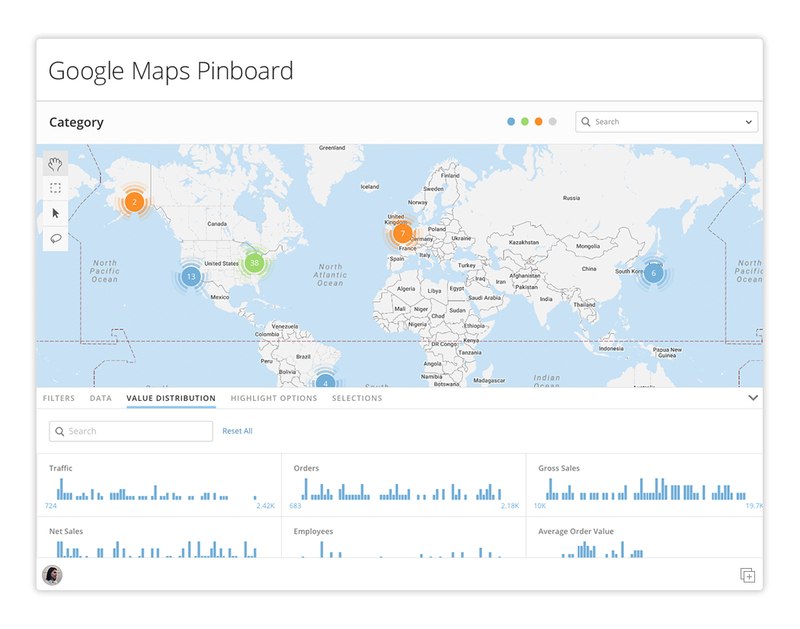 And since you decide which metrics you want to visualize, Google Maps Pinboard is one of the most versatile apps in the Domo Appstore. Make the world a little smaller, and your decisions a whole lot smarter. When you have the power to neatly display all of your location data on an interactive map, there’s seemingly no end to the geographic insights you can uncover—regardless of whether you work at a small regional business or a giant multi-national corporation. For instance, if your ecommerce company was looking for a place to rent a new office, you could find a geographically convenient location by using Google Maps Pinboard to quickly display where all of your employees live. Similarly, you could plot out the locations of your customers or social media followers to better understand your target audience and to tailor your communications to them based on those findings. Meanwhile, an international chain store could use the tool to see every one of their retail locations that had monthly sales above a certain value. Perhaps you’d find that your best-performing locations are clustered in suburban areas or in regions with colder climates. From there, you could begin the process of trying to figure out what’s causing these trends. More than anything else, Google Maps Pinboard helps you ask questions that you otherwise never would have considered, allowing you to dig deeper into your data and make smarter business decisions.